Christine Blasey Ford is pushing for an independent investigation into her allegations that the Supreme Court nominee sexually assaulted her while they were both in high school. Christine Blasey Ford told Senate Judiciary Committee chairman Chuck Grassley Tuesday that she wants the FBI to investigate her claims of sexual assault against Supreme Court nominee Brett Kavanaugh, raising further doubts about whether she and Kavanaugh will appear before the committee on Monday. Ford’s attorneys did not explicitly say in a letter to committee leaders that she will not appear on Monday, but said that an inquiry by the FBI “will ensure that the crucial facts and witnesses in this matter are assessed in a non-partisan manner.” Republicans have signaled that they will move forward with the hearing regardless of whether Ford shows up or not. “While no sexual assault survivor should be subjected to such an ordeal, Dr. Ford wants to cooperate with the Committee and with law enforcement officials. As the Judiciary Committee has recognized and done before, an FBI investigation of the incident should be the first step in addressing her allegations,” said Ford’s attorneys, Debra Katz and Lisa Banks. 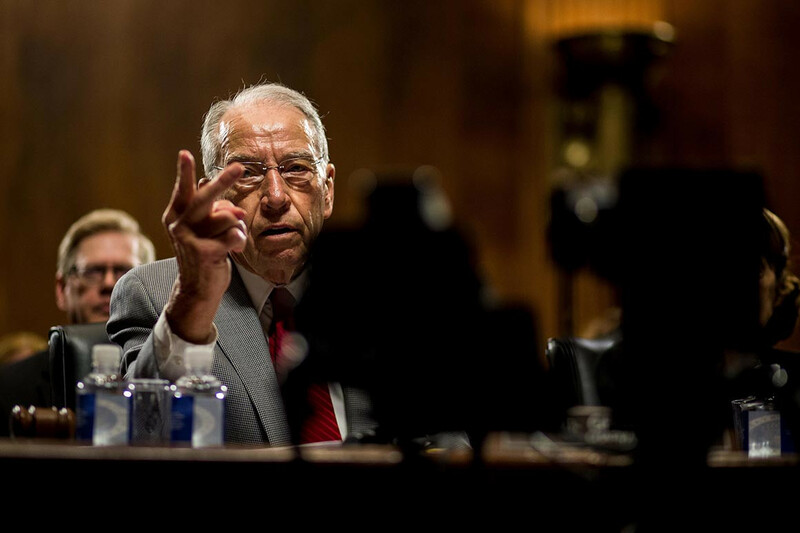 Responding to Ford, Grassley suggested on Tuesday evening that Monday’s scheduled hearing should proceed regardless of whether or not she is willing to appear. Ford’s push for an independent investigation into her allegations that Kavanaugh sexually assaulted her while they were both in high school is consistent with the demands of Senate Democrats who have asked for the FBI or an independent counsel to investigate the claims instead of having senators trying to suss out the truth through a hearing. Kavanaugh has repeatedly denied Ford’s allegations. Republicans, however, have been angered by Democrats’ repeated calls to delay action and seem unwilling to hit the brakes regardless of whether Ford testifies. Kavanaugh has already agreed to appear Monday. Still, whether and when they move forward depends on a handful of swing vote Republicans, namely Sens. Susan Collins of Maine, Lisa Murkowski of Alaska, Jeff Flake of Arizona and Bob Corker of Tennessee. Those senators are either undecided or insisted upon slowing down the process in order to hear Ford. Regardless of whether Ford appears, Republicans said they could hold a committee vote on Kavanaugh as soon as next week. Thursday’s panel vote was canceled amid the new allegations. Still, Republicans’ initial goal of getting Kavanaugh, a 53-year-old appeals court judge, confirmed in time for the Oct. 1 start of the Supreme Court’s term is already in serious jeopardy. In appearance on CNN, which first reported the letter, Banks would not say whether Ford would show up on Monday if there was no investigation. But she made clear that she believes a thorough investigation is unlikely to occur before Monday. The FBI did conduct an FBI investigation before Anita Hill’s testimony before the Senate Judiciary Committee regarding allegations of sexual harassment by now-Supreme Court Justice Clarence Thomas. The FBI said before Banks and Katz’s letter was made public that they would not be conducting an investigation. Kavanaugh’s backers cryptically said that he will be vindicated and Feinstein will be worse off in the coming days for how she handled the allegations, which she received in July but leaked out in the press over the past week until Ford came forward. Ed Whelan, president of the Ethics and Public Policy Center, said on Twitter that Feinstein will soon apologize to Kavanaugh. In an email exchange, Whelan declined to comment on whether Kavanaugh and his allies had obtained new information that made him confident he would clear his name. “I’ll stand by my tweet. I genuinely expect that Feinstein will apologize to Kavanaugh and his family,” he said. Senate Majority Leader Mitch McConnell (R-Ky.) told reporters Tuesday that Ford would have “the opportunity to be heard,” whether in public or private, and that he’s not concerned about the matter unraveling Kavanaugh’s nomination. Indeed, one of the critical Republicans remaining undecided on Kavanaugh suggested that he wouldn’t oppose moving ahead on the confirmation if Ford decides to forgo testimony. “I don’t know how they can say: I’m just not going to appear. She has the option of a closed session, with cameras or without. We want her to appear. And then she has said, before we made the decision, that she wanted to appear. So that’s what we want,” Sen. Jeff Flake (R-Ariz.) said after he and other Judiciary Committee Republicans met with McConnell for nearly an hour. Republicans have moved to slim down the hearing to just Ford and Kavanaugh. A key witness in Ford’s decades-old allegation, Kavanaugh’s high school classmate Mark Judge, said Tuesday he would prefer not to testify. Judge, who Ford says was the third person in the room when Kavanaugh assaulted her, said in a letter to the Senate Judiciary Committee that “I have no more information to offer the committee and I do not wish to speak publicly regarding the incidents.” Democrats want Judge there. Judge wrote a memoir that discusses his binge drinking while in high school and another book that features a character named “Bart O’Kavanaugh” drinking heavily. But his resistance to speaking further about what Ford has alleged was an assault fueled by alcohol abuse likely closes the door to any appearance before the Judiciary panel, since Republicans would be able to defeat any Democratic attempt to subpoena Judge’s testimony. Grassley’s staff spent the day trying to contact Ford’s attorneys to no avail. Feinstein’s staff similarly had heard nothing from Ford’s lawyers until receiving the letter. Republicans have billed the public hearing as an opportunity for both Kavanaugh and Ford to share their sides of the story. GOP leaders made that decision under pressure from undecided members of their conference — chiefly Flake, who said he would vote against Kavanaugh in the committee unless senators were given more of a chance to hear from Ford. If Ford and her lawyer ultimately opt out of the GOP’s public hearing invitation — Democrats have skipped a staff-level call with Kavanaugh on the matter, casting doubt on their participation — Republicans would face another tough decision on whether to press ahead with the nomination. While the GOP waits to hear about whether Ford will testify, senators also are discussing the use of a third party to question Ford in an effort to make the hearing appear more fair and less political, according to one GOP senator. Collins recommended to Grassley that counsel for Ford be allowed to question Kavanaugh and that Kavanaugh’s counsel be allowed to ask questions of Ford. And Sen. Doug Jones (D-Ala.) floated the idea of an independent counsel who would ask questions of both Kavanaugh and Ford.